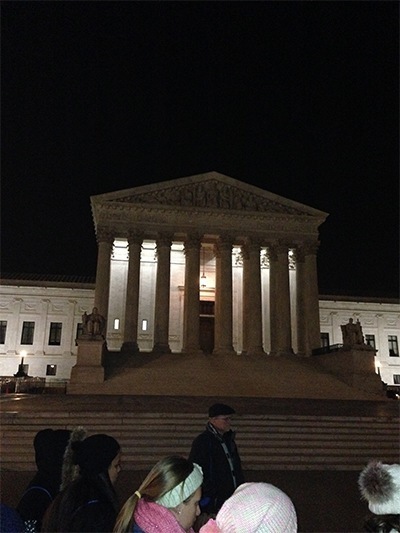 High school students from the Archdiocese of Miami celebrate Mass on the first day of their Pilgrimage for Life to Washington, D.C.
Braving frigid temperatures, high school students from the Archdiocese of Miami take part in an evening prayer vigil in front of the Supreme Court. On Monday, Jan. 20, 120 representatives of the Archdiocese of Miami, led by the Respect Life Office, arrived safe and sound in Washington, D.C. 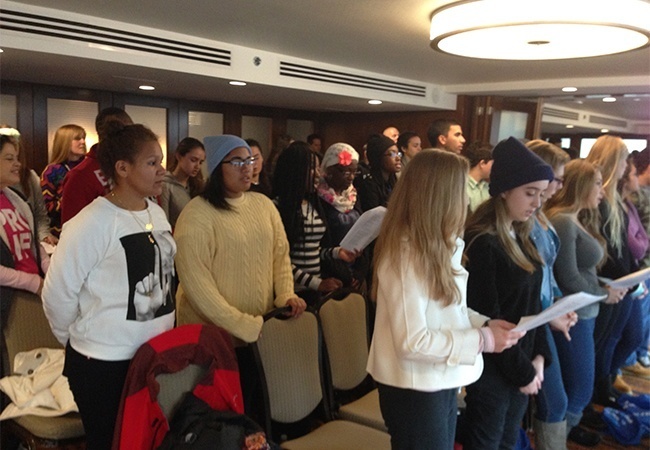 The group was reminded that Monday was Martin Luther King, Jr. Day, a day dedicated to a leader of social justice here in the United States. We celebrated a man who committed his life to raising the nation’s standards for promoting life and freedom. This holiday helped to put before us the call for the Respect Life movement to reverence all life, to care and respect all people, and to value all people from conception to natural death with the dignity our Creator has given to each of us. 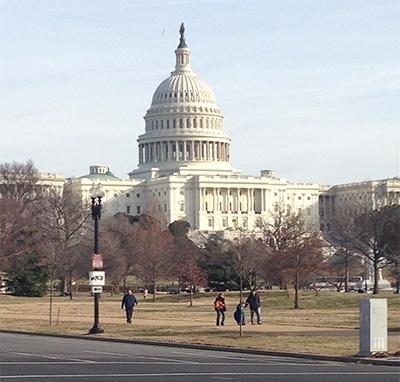 View of the Capitol building in Washington, D.C., where high school students from throughout the Archdiocese of Miami were taking part in the annual Pilgrimage for Life organized by the Respect Life Office. They will walk in the March for Life Jan. 22, anniversary of the Supreme Court decision that legalized abortion in the U.S.
Later on Monday, we traveled to the Holocaust Museum to see one of the most horrific examples of how human life can be devalued and made less than God intended. As we celebrated Mass that evening, Father Daniel Martin, parochial vicar at Little Flower Church, Coral Gables, asked a simple but profound question: "Why is it that the events of the Holocaust and our tour of the museum so easily provoke outrage and anger, but the continued slaughter of innocent children in the United States is ignored by many in our country and world?" After our tour of the Holocaust Museum we walked to the White House where we prayed as a group for the conversion of the hearts and minds of our elected officials, especially for the President and members of the executive branch of our government. We ended Monday with a prayer vigil led by faculty and students from Archbishop McCarthy High School at the steps of the Supreme Court (and in the shadow of the United States Capitol building). We prayed for the members of the Supreme Court and for the countless aborted children since the passage of Roe v. Wade. Our plans for Tuesday were interrupted and adjusted due to a massive winter storm which was expected to dump up to 8 inches of snow on the nation’s capital. For the majority of the students traveling, this is their first time seeing snow, let alone being able to run out and make snow angels in front of our hotel. 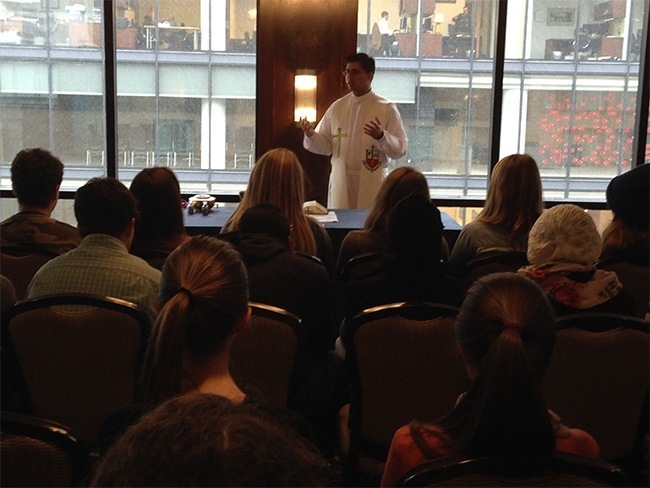 Father Daniel Martin, parochial vicar at Little Flower Church in Coral Gables, celebrates Mass for students taking part in the annual Pilgrimage for Life to Washington, D.C.